Two of these featured artists’ books are Britain’s Birds and Their Nests (2015) by Kerry Miller, and four and twenty black birds (2004–07) by Carol Todaro. These entrancing works are linked not only by their medium and their focus on nature, but by their specific focus on birds. Birds have a long history of intricate symbolism in literature and art. Depending on the species and context, birds can stand for a plethora of ideas ranging from resurrection to greed. Because of their ability to soar to heights that mankind cannot naturally reach, birds commonly represent freedom. Bursting from the confines of a textbook’s binding, the winged creatures in Britain’s Birds and Their Nests embody carefree liberation. The viewer can almost hear the cacophonous sounds issuing from their open beaks. 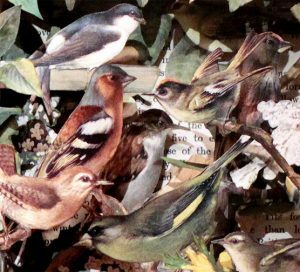 Kerry Miller extracts the text in a natural history book to reveal a three-dimensional riot of colorful birds. Miller states that the purpose of her work is to release images from books, and here she successfully delivers the birds from the constraints of cold, scientific fact. She allows her birds to take ownership over text-based analyses of their biology and behavior. While Miller’s birds seem liberated, the blackbird in Carol Todaro’s large-scale book work appears to be irreversibly trapped within the graphite-laden pages. 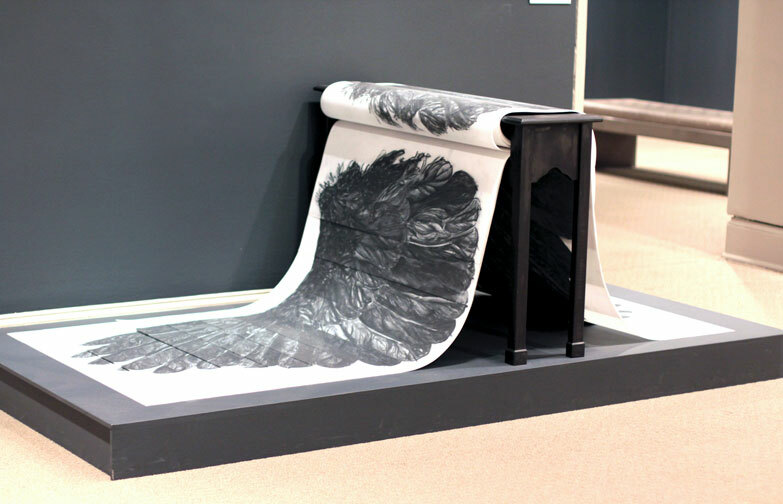 This blackbird’s disembodied wings are laid flat upon a black stool while being spread thin over translucent pages. The title of the piece, as well as the dark hue of the graphite, alludes to a haunting nursery rhyme that details the killing of many blackbirds for human consumption. The eerie tone of Todaro’s book contrasts with Miller’s blithe one. 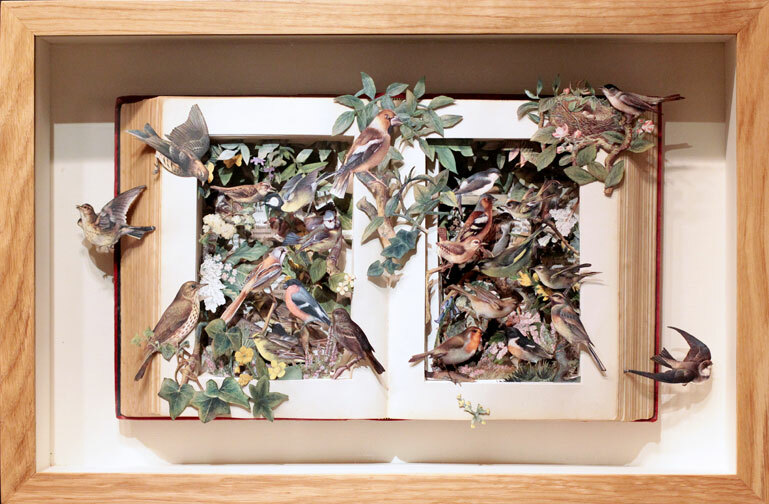 Both allow birds to interact with their book medium, but one compares the motion of a wing to the opening of a page, and the other shows birds flying from a book’s leather binding. In works by these artists, the bird can remain a symbol of freedom or, alternatively, have its wings clipped.